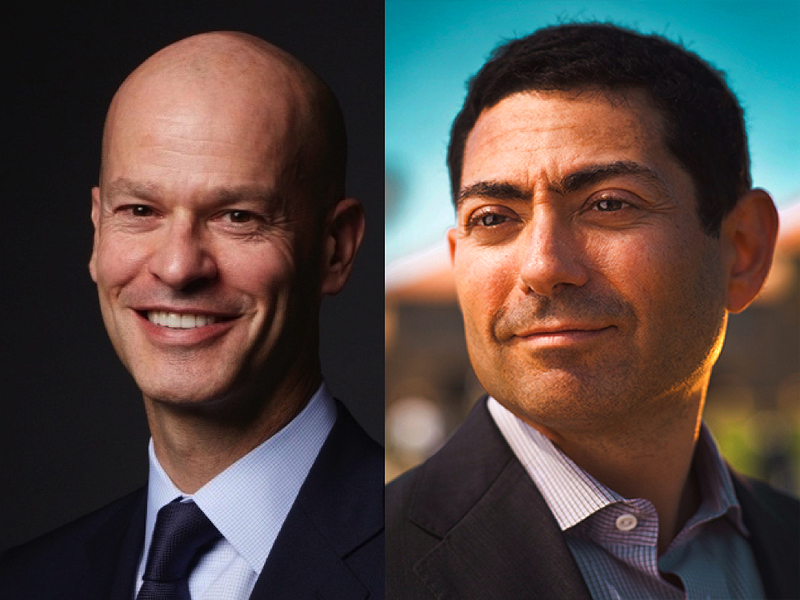 Timothy R. Barakett ’87, M.B.A. ’93, and Mariano-Florentino (Tino) Cuéllar ’93 have been elected fellows of the Harvard Corporation, effective July 1. Barakett, a native of Canada who founded and led a large hedge fund for 15 years, is now a private investor and philanthropist. He held leadership roles in The Harvard Campaign, focusing particularly on undergraduate financial aid. Cuéllar, a native of Mexico, moved with his family to California at age 14. He earned an M.A. in political science from Stanford; a J.D. (Yale); and a Ph.D. in political science (Stanford). He is a member of the Board of Overseers, and has served as a justice of the Supreme Court of California since 2015. Details are available at harvardmag.com/barakett-cuellar-19. As they succeed Susan L. Graham ’64 and Jessica Tuchman Mathews ’67, the Corporation loses some gender diversity, but gains international representation. And Barakett replenishes some of the fundraising prowess that departed last year when Joseph J. O’Donnell ’67, M.B.A. ’71, concluded his service. Separately, City Year co-founder and CEO Michael Brown ’83, J.D. ’88, and Lesley Friedman Rosenthal ’86, J.D. ’89, The Julliard School’s chief operating officer, will be the Board of Overseers’ president and vice chair of the executive committee in academic year 2019-2020. According to the Council for Advancement and Support of Education’s Voluntary Support of Education survey, charitable giving to higher education totaled $46.7 billion in fiscal year 2018, up 7.2 percent from the prior year. Harvard, Stanford, and Columbia each realized more than $1 billion. In total, they and the seven other most successful fundraising institutions (UCLA, University of California San Francisco, Johns Hopkins, Penn, the University of Washington, USC, and Yale) received more than $8.4 billion: about 18 percent of total giving that year, derived from reports from 929 respondent institutions.…Emulating their U.S. peers, international universities that recently received landmark gifts include McGill, in Montréal ($151 million for full master’s and professional-degree scholarships), and Cambridge, in the United Kingdom ($130.5 million, for graduate and undergraduate scholarships).…And Johns Hopkins, fresh off a $1.8-billion gift from Michael R. Bloomberg, M.B.A. ’66, LL.D. ’14 (not in the tallies above; see Brevia, January-February, page 27), has agreed to buy the Newseum site, near the U.S. Capitol, in Washington, D.C., for a reported $372.5 million, to house its School of Advanced International Studies and other nearby graduate programs. Bloomberg was reported to have helped support the purchase and planned renovations into 400,000 square feet of academic space. The University’s 2018 Town Gown Report, to Cambridge, released in January, envisions further campus construction, beyond such mega-projects as the continuing House renewal and completion of the engineering and applied sciences complex in Allston. Among the jobs wrapping up are renovation of the Sackler Building, formerly part of the art museums, for the history of art and architecture department, the Graduate School of Design, and new art-maker spaces; and the Radcliffe Institute’s Schlesinger Library renovation. Notable new work includes renovating and expanding (outward and upward, with a new fifth floor) the Law School’s Lewis International Law Center; renovating Harvard Hall, to upgrade classrooms and restore the exterior; and overhauling the Divinity School’s Andover Hall, including an addition, scheduled to begin this summer. California’s Kaiser Permanente healthcare system is launching a medical school aimed at training doctors for integrated-care teams (the model it practices); it will waive tuition for the first five student cohorts.…New York University, which raised aid funds to make its medical school tuition-free last year, is inaugurating a second school, on Long Island, to train primary-care physicians—again, with full-tuition scholarships.…Yale School of Medicine announced that its “unit loan” (the amount students are expected to borrow before receiving need-based scholarships) will be reduced from $23,000 to $15,000 per year for all students attending in the 2019-2020 academic year and thereafter; the new debt expectation is half the level required two years ago. Harvard Medical School’s posted unit loan this year was $33,950 for current students; those who graduated in 2018 had an average medical debt of $110,548. On March 1, HMS dean George Q. Daley announced a new aid formula that does away with the unit loan, subtracts the expected family contribution from tuition and fees, and should, over time, reduce entering students’ debt upon graduation by $16,000 from the prior $110,000-plus. The new formula will apply to all students receiving aid, effective in the fall term, with funding guaranteed for their four years of study. On April 2, as this issue went to press, the University held its first “Harvard Hears You: The 2019 Summit for Gender Equity,” coinciding with the beginning of a new iteration of the Association of American Universities’ sexual-conduct climate survey. University officials spoke during events at Smith Campus Center. A celebrity panel at Memorial Church—focusing on popular culture, advertising, and consumerism, according to a University announcement—featured actress and transgender-awareness advocate Laverne Cox. The College announced that it has merged its office of equity, diversity, and inclusion with the Harvard Foundation for Intercultural and Race Relations (long led by the late S. Allen Counter). The new unit will report to an associate dean for inclusion and belonging who is “charged with ensuring that our programs and services are responsive to the changing demographics and needs” of undergraduates, once that vacancy is filled. That officer will also oversee the Title IX office, office of BGLTQ student life, and women’s center.…The foundation’s artist of the year, recognized at the Cultural Rhythms festival in March, was writer and transgender activist Janet Mock.…The College has also organized a Working Group on Symbols and Spaces of Engagement, under professor of Indo-Muslim and Islamic religion and cultures Ali Asani; it will examine campus spaces, symbols, and programming to “advance an inclusive learning environment,” according to its charge. Plans for the renovation, shared with the community in February, point to better sleeping quarters and common rooms for the 450 resident undergraduates; enhanced student-activity spaces; better ways to connect the House’s six disparate buildings, trisected by city streets; enlarged dining areas; a fully functional, modernized Pool Theater (at left); and a proposed “loft,” subject to Cambridge approval, created by raising the roof over the dining hall, yielding a flexible, multipurpose facility for student and House use. Given the complex program and tight quarters, construction will be in three phases, extending from this June through the summer of 2023. More information, and further plans, appear at harvardmag.com/adams-redo-19. Applications—and costs—increase. The College received 43,330 applications to the class of 2023, up 1.4 percent from the prior year, and admitted 1,950. Before taking financial aid into account, the hopefuls face a higher sticker price for the privilege: the term bill will be $69,607, up 3 percent from $67,580 in the current academic year. Peer schools reported receiving more applicants, too—and also breached the $70,000 barrier with tuition, room, board, and fees for 2019-2020 reaching $72,100 at Yale and comparable levels at Cornell and elsewhere. Details are available at harvardmag.com/2023admits-19. Middlebury Divests. In January, Middlebury College adopted its Energy2028 plan, envisioning a complete transition to renewable energy for campus electricity and thermal power by that year; a 25 percent reduction in campus energy consumption; progressive divestment of endowment fossil-fuel investments (eliminating them within 15 years, thus reversing the decision not to divest made in 2013); and enhanced educational opportunities for its entire community. Balancing the medical books. Harvard Medical School dean George Q. Daley disclosed in his state of the school address that its sale of a long-term leasehold interest in 4 Blackfan Circle, effected last year for $272.5 million (see News Briefs, September-October 2018, page 21), had enabled HMS to pay off more than half its debt, “improving cash flow and moving the school toward a balanced budget.” Details (on debt remaining, other uses of the proceeds—to augment the endowment or support research, perhaps—or prospective improvements in operating results) have not yet been forthcoming. Beyond a lifetime of giving. David Rockefeller ’36, G ’37, LL.D. ’69, a towering University citizen, launched the eponymous center for Latin American studies and, in 2008, made a $100-million gift to fund study abroad and equip the Harvard Art Museums with student study centers. His support for his most cherished institutions lasted beyond his death in 2017. The proceeds from the estate sale of his collections produced additional bequests, including $200 million-plus to the Museum of Modern Art, which named its directorship in his honor. Harvard has received a further sum, too—likely benefiting undergraduate education and his other interests (details were not yet available at this issue went to press). Dining on high. The Heights, the tenth-floor restaurant at the Smith Campus Center, began lunch service on March 4, followed by lounge/cocktail service (until midnight) as of March 26, with dinner service to follow. Miscellany. Stipends for Graduate School of Arts and Sciences students will be increased 3 percent during the 2019-2020 academic year.…Deerfield Management has committed $100 million to invest in the commercial development of biomedical and life-sciences inventions from Harvard laboratories; the Office of Technology Development (see “Accelerating Innovation,” March-April, page 18) represented the University in organizing the partnership.